Happy New Year, my lovelies! What better to kick off 2013 than a sea of glitter? And no, I don't mean all of the confetti still stuck to your hair from last night! Even though Christmas has passed, I'm still head over heels for R. Hobby Cosmetics's Peppermint Shatter. It's like I got a crushed up candy cane and decided to turn lemons into lemonade... or rather, nail art. It's really unique and well thought out. The above is two coats layered over two coats of Zoya Holly. Oh, Maisie Shine Aquarium. How I adore thee. 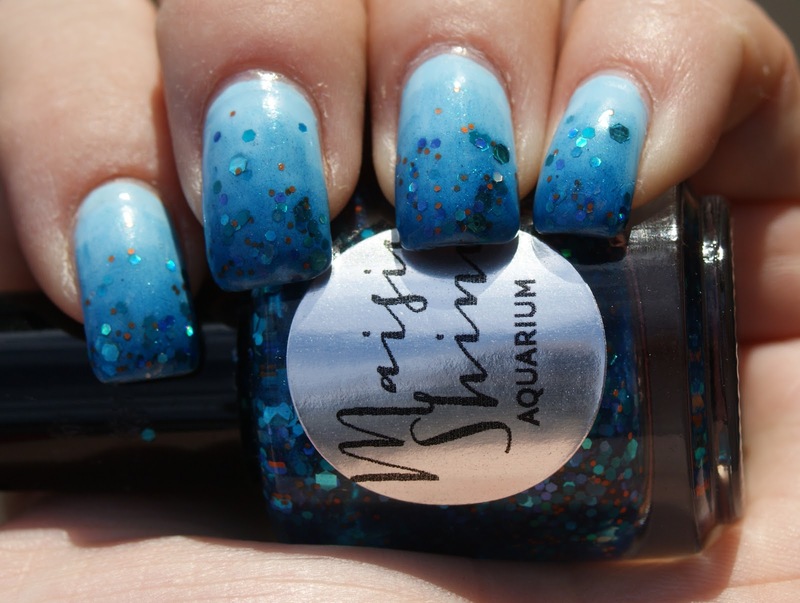 This glitter bomb consists of an aqua jelly filled with varying shapes and sizes of blue and silver glitter. Above, it's layered over Nfu Oh 61 for a really cool underwater look. Here, you can see how I built up coats of Aquarium to create a really cool gradient effect. Every time I see the chunks of glitter, I feel like they're fish in the depths of the ocean. So there you have it folks... my Top of 2012! I hope you enjoyed this little segment of posting while I was away and went digging through your own stash to find your favorites. Glitter forever. Love the first over that Holly! Just found your blog!! LOVE all the nail polishes that I have seen so far! !